Great Britain’s Ben Maher took a sensational second win of the season today, following a breathtaking jump-off in the Longines Global Champions Tour Grand Prix of Ramatuelle, Saint Tropez. The fight for the 2018 title has intensified after Edwina Tops-Alexander’s podium sees her regain the overall ranking lead. Tops-Alexander takes back the coveted leader's armband as the Championship race heads along the Cote D’Azur to Cannes, where she now leads with 154 points overall. Ben Maher (GBR) sits just behind in second, with 143 points, and long-time leader Scott Brash (GBR) is now third with 131 points overall. Both Tops-Alexander and Brash are in the running to make history with a third Championship title, as the Tour now looks to the 7th leg of the 2018 calendar. A delighted Maher spoke of his special horse; "Winning Good is only nine years old and I’m really lucky with the horses I am riding now. It has been an amazing season so far! We are already in the GC Play Offs but hopefully this has given me a boost in the ranking." The first event of the season on the French Riviera delivered a dazzling Mediterranean experience for spectators and fans watching live around the world. Situated metres from the famous Pampelonne Beach at Ramatuelle/Saint-Tropez, the event was an exhilarating mix of top sport and Riviera lifestyle with global brands from Longines to McLaren, Dolce & Gabbana, Hermès and Julius Bar on site. The lively atmosphere in the stylish hospitality and cocktail lounges around the sand arena created a lively atmosphere with a cool Saint Tropez vibe. Ramatuelle Mayor Roland Bruno spoke of his pride at the location being on the LGCT global circuit alongside a star-studded line up of international cities and Riviera destinations. He said: “It is very important. This is a very high quality competition and event and it’s like having the ATP tennis being part of this kind of circuit. It is a beautiful show." It was a Grand Prix with top riders from start to finish delivering a supreme display to show jumping fans worldwide. Uliano Vezzani’s testing course demanded perfection and no room for error with a challenging Longines triple combination, plus a tricky double of GC verticals that fell at the lightest of touches. Stars such as Christian Ahlmann (GER) and Daniel Deusser (GER) both suffered 4 faults at the double and further faults later in the course to their immense disappointment. Kevin Staut (FRA) and John Whitaker (GBR) also suffered from errors at the GC double combination, situated next to the grandstand, with both experienced riders clocking up 8 faults thanks to the challenging and technical course set by designer Vezzani. But there were success stories as the clear rounds mounted up. First to go through on a zero score was Peder Fredricson (SWE) with Hansson WL - he was quickly joined by Lillie Keenan (USA) and Supersox, the bouncing bay gelding flashing his white legs as he picked up his knees expressively around the arena. “He’s got a really big heart and I’m so grateful to have him. The course tests the technical side but also the scope of the horse, so I’m lucky to have Sox as it was no problem for him!” said Keenan. Belgian star Olivier Philippaerts with H&M Legend of Love was another of the early riders into the jump-off with Niels Bruynseels (BEL) and Gancia de Muse joining them. Edwina Tops-Alexander (AUS) piloted California to a determined clear round with an energetic performance by the bay mare cementing their place in the jump-off. British star Ben Maher again demonstrated his tremendous form this season by securing a slot in the jump-off with his 9 year old horse Winning Good followed by Carlos Lopez (COL) and Admara 2 to make it seven into the final showdown. First to light up the jump-off, Peder Fredricson (SWE) was swift over the early part of the course. The pair rolled back to the Dolce & Gabbana fence, with a big gallop to the last line over the skinny oxer and took five strides to the final Longines fence. Clear and quick, the duo threw down the gauntlet in 39.77s. Lillie Keenan (USA) and Super Sox were superbly fast but notched up an agonising fault at the second to last fence. Temperatures soared once more as Olivier Philippaerts (BEL) on H&M Legend of Love shifted up a gear with fantastic tight turns to make up time, throwing everything at the last line but agonisingly knocking down the final fence. Niels Bruynseels (BEL) was unbalanced by a spook on the early part of the course, with the Belgian clocking up four faults at the Julius Bär vertical and ruling himself out of contention. A danger to Fredricson’s lead, Edwina Tops-Alexander (AUS) and California set off to a flying start. Tops-Alexander took a few extra strides but her mare made up the ground in between, propelling them into the lead in 38.78s. But a win was not guaranteed, with two riders will still to go. Ben Maher (GBR) and the Poden Farms-owned 9 year old Winning Good took on the challenge, with fast flowing start to the jump-off. Maher then hit the accelerator to go flat out to the double Longines combination, leaving spectators on the edge of their seats as to whether they’d clear it. The young horse showed all his scope and talent, as the pair rounded up to the final stretch, galloping clear in 37.44s to whoops of sheer delight from GCL team mate Emily Moffitt who is trained by Ben. The LGCT Grand Prix win was down to the wire as the final horse and rider entered the arena. Carlos Lopez (COL) and Admara 2 lost time early on in the course, but it looked too close to call as they galloped down the final line. All eyes were on the clock, but it wasn’t enough as it stopped at 38.41s, with the Colombian rider taking second place. 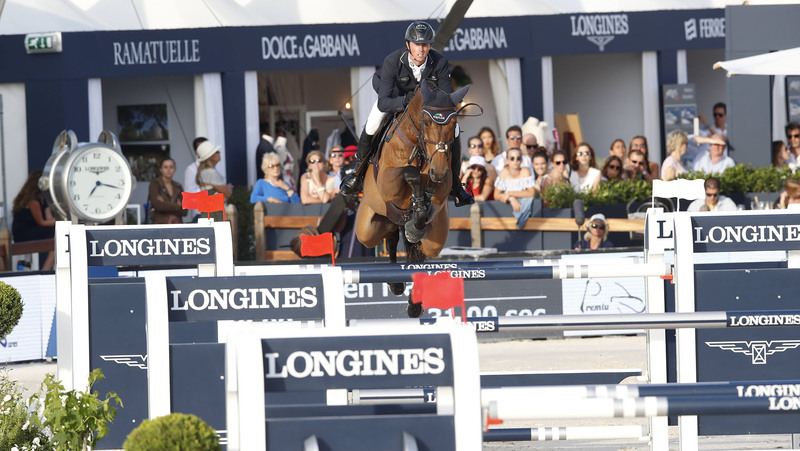 So it would be Ben Maher who sparkled in Saint-Tropez, shooting up to second in the overall LGCT ranking. Carlos Lopez (COL) would earn a place in the GC Play Offs and the Longines Global Champions Tour Super Grand Prix, after Maher’s earlier win in Madrid saw him claim his ticket to the final showdown in December. Jan Tops, President Longines Global Champions Tour: "It is an amazing place. Everything is perfect. Uliano did such a great job. It is such a high level, such a prestigious class and so difficult to get 6 - 8 horses in the jump-off so he did a masterful job. We have great events with Cannes, Cascias and Monaco coming; these are special events and people love to be there. "On the ranking Edwina has been very consistent. Ben has been fantastic, two times first and Scott is a little bit on the same level. Everything is still possible to the end. With the new Super Grand Prix everyone wants to qualify, and we have some amazing horses and riders already. It is going to be an incredibly prestigious class to win, as is the GCL Super Cup for the teams." Denis Monticolo, LAOHS Event Director: "To have the Longines Global Champions Tour here is an honour and we have to celebrate these great riders. The level is really high, it is incredible. We have to really appreciate being here in Ramatuelle/Saint-Tropez, the City of Ramatuelle has been supporting us a lot and it is a win win situation with top sport, entertainment and lifestyle." Edwina Tops-Alexander, Third Place and new LGCT Ranking Leader: "Ben and Scott are in a very strong position. I just have to hang in there and get better results and try to be on the podium at more events. The level is so high and it is challenging it is interesting for the riders and the public. California has been in super shape, she is pretty fresh and she is just really on form. I was a little bit slow turning back to the double but all in all my horse jumped amazingly." Carlos Lopez, Second Place: "The strategy is always to go really fast. I think I made a mistake between 1 and 2 with one more tried but I am still really happy with the horse. I didn’t know I had qualified for the [Longines Global Champions Tour] Super Grand Prix and I am really looking forward to it." Ben Maher, Winner: "I just kept telling myself he is better the more he jumps. I am very proud to be able to ride these horses. "It has been incredible, they are only 9 year old horses. In Madrid (LGCT GP Winner) everything went to plan. Today nothing went to plan at all but I had a bit of luck. I knew I had to be quick. I saw my stride a very long way back. I don’t know how he jumped it but my luck was in today.